From a practical point of view, infill is the ideal model. The homes are near existing infrastructure and are located in established communities with mature trees, and homeowners have access to parks, cultural amenities, transit, retail, and essential services. But infill also offers wondrous design opportunities. Projects designed and built under difficult conditions or restrictions often yield inspired results, and infill presents some doozies. An architect or builder working on such projects may face any combination of constraints, including small or odd-shaped lots, tough zoning laws, historical architecture guidelines, setback requirements, and more. Having participated in numerous design awards programs over the years, I’ve seen the results when homes are built under such duress: creative elevations, inventive floor plans, clever storage options, and imaginative details. Architects, forced to think outside the box, generate innovative designs to satisfy their clients. This month we bring you two first-rate infill projects—a charming Minneapolis cottage on a wedge-shaped lot and a circa 1908 San Francisco row house that underwent a stunning modern makeover. Designed by Minneapolis-based Peterssen/Keller Architecture, the Kenwood Cottage is long and linear, allowing southern light to penetrate its interiors and has a 16-foot wall of double sliding glass doors overlooking the wooded backyard. The beauty of the home is that it’s also close to downtown and has two lakes within walking distance. On the coast, San Francisco-based Studio VARA and Dijeau Poage Construction had to problem-solve a sloping site and seismic reinforcement standards for its 2,000-square-foot addition. Each project takes a different approach to design, but the results are equally impressive. 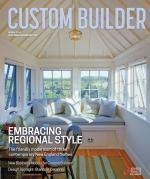 The infill story is a nice juxtaposition to our cover feature on vacation homes. While full-time residences tend to be more formal in spirit and traditional in design, second homes are usually more relaxed, contemporary, and strike a nice balance between Spartan utility and relaxed comfort. Of course, the only way to execute a complicated infill project or build the perfect vacation home is with a harmonious collaboration between builder and architect. But this often is not the case, due to a love-hate relationship between architects and builders, our guest columnist Mette Aamodt, AIA, writes this month. Comments on: "Town and Country"